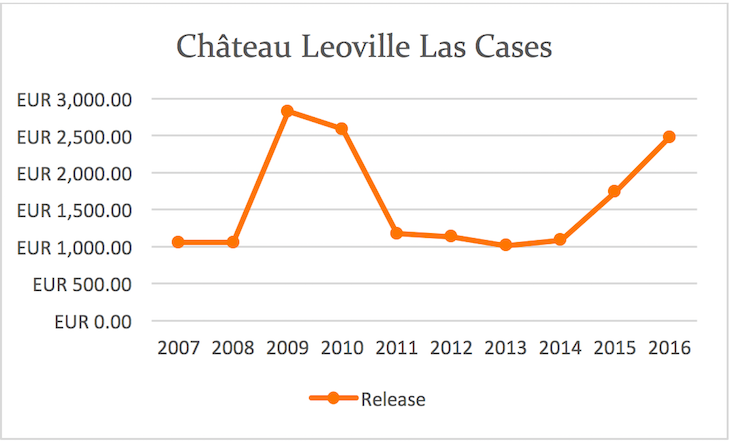 – As much as I loved the 2016 Leoville Las Cases, the huge price increase of over 40% from 2015 seems excessive. 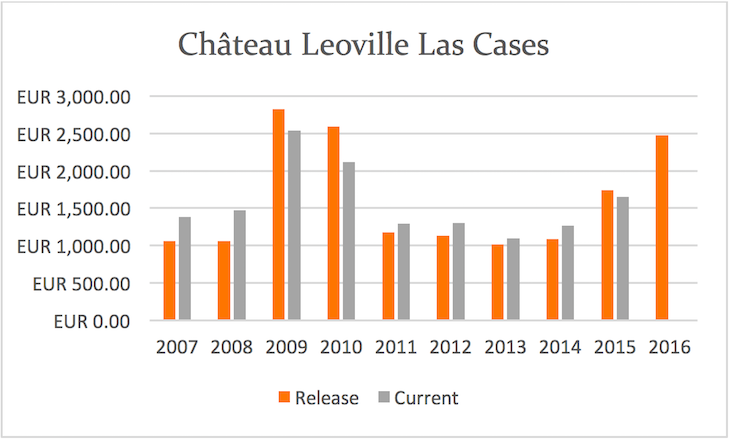 – Area under Vine: 98 ha producing 10,000 to 15,000 cases per year for Leoville Las Cases. – History: The vineyards of Leoville Las Cases goes back several hundred years and at one time was one of the largest vineyards in Bordeaux called Domaine de Leoville with more than 300 hectares. The estate was split up after the French revolution and only three-fifths of the original estate, situated in the heart of the vineyard, remained. In 1900 Théophile Skawinski, who was the great-great-grandfather of the current owner, purchased a share of the property and became the manager. – Current Owners: Jean-Hubert Delon and his family own Leoville Las Cases; the property has been under the Delon family for over 100 years. – One of the oldest Medoc estates that was divided into the following three properties after the French revolution: Château Leoville Las Cases, Château Leoville Barton and Château Leoville Poyferre. – Léoville Las-Cases was one of the first to introduce a second wine, Clos de Marquis, in 1902. However, the Las Cases team points out firmly that since Clos du Marquis always comes from the same area further west of the vineyard from which Las Cases gets its fruit, it is a separate, distinctive wine with its own terroir. The second wine of Las Cases created in 2007, has the much longer name of Le Petit Lion du Marquis de Las Cases (Petit Lion for short). 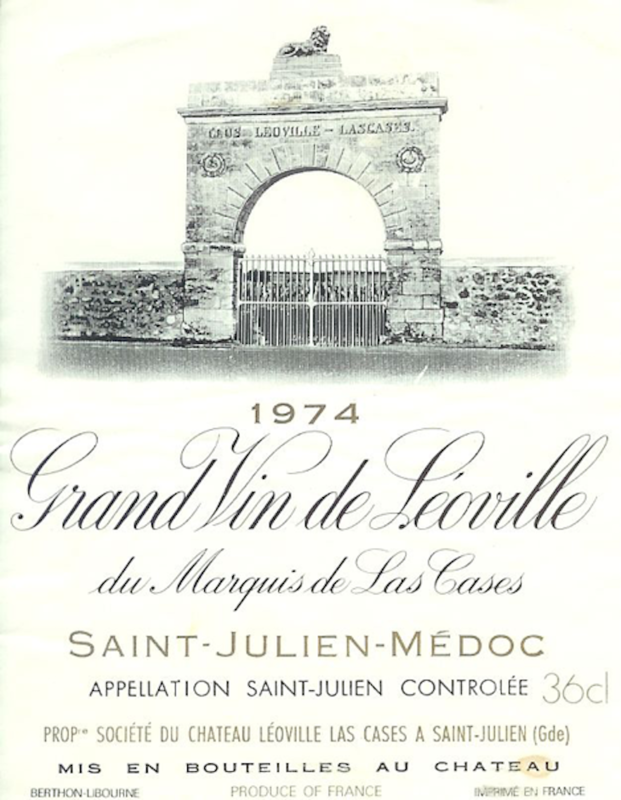 Ask any Bordeaux wine lover or professional which Saint Julien chateau has the longest aging potential and Las Cases would come immediately to mind. While most Saint Julien estates are supple, round and charming, Las Cases is austere in its youth, structured throughout its long life and always powerful and classic. The style, thankfully, has never changed with the winds of fashion over the years and in many ways I believe this is due to the owner, Jean-Hubert Delon. He is an avid collector of wine and anyone fortunate enough to share a meal with him at his home knows that his cellar rivals any top Michelin star restaurant. He knows and understands quality and keeps true to his traditional roots. No matter that his wines take twice as long to come around and open up compared with this neighbors, many, like me feel it is worth the wait. Recent vintages are sublime, both the 2016 and 2015 are tremendous and I will likely rate them even higher with time in bottle – in about 20 years time. I am now enjoying his wines from the 1980s, the 1982 is glorious, the 1988 balanced and classic while the beautiful 1989 is just starting to reach its peak. Plush, opulent, powerful Las Cases with enormous concentration combined with a supple, velvety texture. Palate offers layers of ripe blackberry fruit, cedar, tobacco and black tea leaves. It is an amazing powerhouse of a wine, made in the classical style to be consumed in 20-30 years, not in the near term. They did less pumping over in this vintage, but the tannins are still tremendous. This vintage is the highest IPT (tannin) levels that Las Cases has ever had. It shows in the wine’s density, thick texture and power. A wine for very long aging. 13.6% alcohol. A great Las Cases with amazing intensity and power and immense concentration. Layers of dark berry fruit, cedar and spice with tobacco notes. The finish is long and very persistent. A wine to cellar for several years. Layers of flavors that range from spices and dark berries to earth and fine herbs. There is both freshness and minerality in this vintage which is wonderful – subtle, layered and intense. A powerful wine by Las Cases this year with a high alcohol level of 14% that is higher than 2009, 2010 or 2005. Layered, intense flavours with only 13% alcohol. The wines are slim and focused with lively dark berry flavours and tannins that are supple and round. The freshness of this wine comes through in the finish. Not a big, generous wine but there is plenty of charm. It is a wine that is open and accessible fairly young but should age for a decade or two easily, 74% Cabernet and 12% Merlot. Nice density and depth in this wine with balanced, velvety tannins that are firm and ripe. There is 74% Cabernet with 15% Merlot in this blend. This wine needs at least 7-8 years to open up. Tasted alongside the 2012 and 2013, this vintage is lighter and more approachable. Notes of violets and cassis on the surface but the backbone of firm tannins offers potential for the wine to age for a few decades easily. 76% Cabernet and 12% Merlot in this blend. This is a gorgeous bottle of Leoville Las Cases that is drinking beautifully now – layers of tobacco leaves, cedar, sweet spices and dried blackberries. It was tasted alongside the 1982 Gruaud Larose and this wine was much more complex, generous and very long. One of the best vintages of Leoville Las Cases I have ever tasted. This mature Las Cases offers a gorgeous nose of aged tobacco, fresh forest mushrooms and dried violets. The palate is complex and very intense with firm, velvety tannins. A beautiful wine in its optimal maturity window with a persistent, long finish. Enjoy now and over the next 10 to 15 years. A complete, well balanced wine with dried blackberry, dark earth and forest floor notes. Intense and focused with freshness and a structured backbone built for long ageing. A wine at its perfect peak with generosity, depth, velvety texture and long finish. Cedar box, cassis and violets on the palate with flavors that linger for over 30 seconds in the finish. Decanted for an hour, this Las Cases is a tribute to the terroir, skill and the wonderful vintage that came together beautifully in this vintage. Tasted blind, this wine was clearly a left bank Cabernet-dominant Bordeaux that is at its peak. The flavors are layered, savory and earthy with a dark fruit, tannic finish. Good structure for a 20 year old wine and built to last – keep another few decades without any problems.